Can you name the only president to actively lead troops into battle? If you guessed George Washington, you’d be right. But probably not for the conflict you’re thinking of. Remember, he hadn’t been elected president yet during the Revolutionary War. 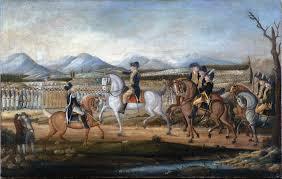 But he did saddle up for one final ride during the Pennsylvania Whiskey Rebellion. Well, he saddled up at a few points anyway—most of the time he rode in a carriage. So what could possibly cause the first president of the United States to muster up 13,000 federal troops to march against the population he’d just freed from British colonial rule? That’s an easier answer: taxes. In order to get the 13 original colonies to adopt the Constitution, the federal government agreed to cover the states’ debts from the war. In order to raise the money, they’d need to establish taxes. In 1791, a federal excise tax was created that would affect all distillers and producers of whiskey and other spirits. As far as taxes go, it wasn’t entirely fair to the poorer, more rural distillers. The tax rate varied between 6 to 18% per gallon, and due to volume, small distillers often paid more than double what the larger distilling operations on the east coast paid. Since all payments had to be made in cash, the bigger distillers could simply pass the increase on to their cash paying customers. But out on the frontier, money was in short supply and barter was still the rule. Needless to say, these taxes didn’t sit well with the distillers scattered throughout the Allegheny Appalachian mountains. It was difficult to transport grain over the frontier’s lousy dirt roads, so farmers would often distill excess grain to sell or trade as spirits. This tax, in essence, became a tax on their disposable income. In the history of bad jobs, we can’t think of one much worse than Appalachian tax collector. These agents were frequently threatened with violence and often came away empty-handed (and occasionally tarred and feathered).2 Washington tried to prosecute tax evaders through the courts, but to no success. In 1794, the situation escalated quickly when a group of angry farmers marched on the home of Federal revenue officer John Neville. The farmers believed that U.S. Marshal David Lennox was there. Lennox had recently served a writ on one of the farmers. The Marshal wasn’t actually in the residence, but that didn’t stop the subsequent shootout, which left one of the protestors dead. Neville and his family managed to slip away, but were later taken when the rebels captured the fort the family was sheltering in. The Neville homestead was eventually burned to the ground in reprisal.